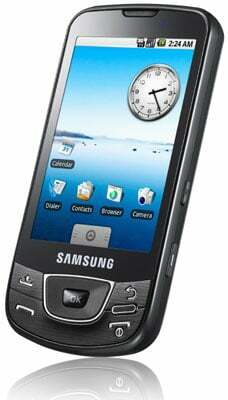 Exclusive Samsung’s first Android-based mobile phone – the Galaxy i7500 - will be launched next week, Register Hardware has discovered. Staff at a handful of O2 retail outlets consulted the chain’s stock management system on our behalf, and told us that the device – which features a 528MHz Qualcomm processor - will arrive in its stores next week. O2 is the exclusive carrier for the Galaxy. The phone isn’t yet listed for sale on O2’s website, but a search filter for handset accessories does allow you to select the i7500 as an option. Sadly, it doesn’t bring back any results. An O2 spokeswoman told us the phone will launch “in the next few weeks”. Thankfully, store staff are a little more up to date. Speculation had been building in an O2 online forum that the i7500’s launch had suffered a setback after allegedly failing to pass O2's handset accreditation process. Exactly what it may have stumbled on isn’t clear, but the spokeswoman said that all the carrier's phones go through a “customer experience process” prior to launch. Should the i7500 have failed one of these mighty hurdles then it’s possible that the phone’s scheduled launch date – which was never circulated outside of O2’s HQ – was moved back slightly in order to give Samsung and O2 enough time to rectify the problem.